What is a wedding dress to you? Choosing your wedding dress feels like such a big decision, and despite all the excitement, you can end up feeling confused and overwhelmed. 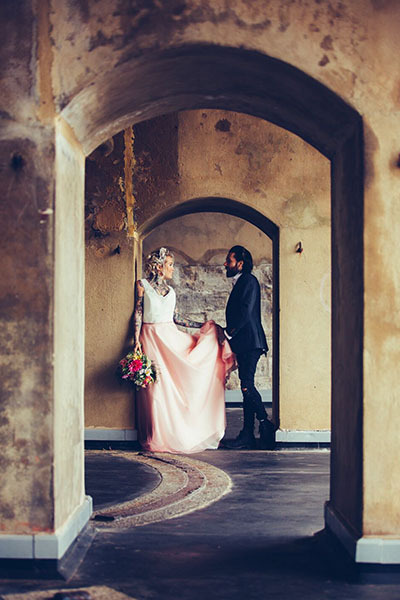 The main thing to ask yourself is ‘what do you imagine yourself in’ – try and really imagine the full picture – how the dress makes you feel, the overall look you want to go for and how that fits with your venue and the rest of your wedding vibe. It can get tricky when you’ve perhaps got friends or family’s expectations to manage, particularly if you know you’re not after a traditional gown and are on the search for something unusual. Try and remember that it is your dress – and when it comes to the day, your loved ones will think you look gorgeous whatever you go for, so make sure it truly reflects you. I guarantee even if its not what they imagined you in on your big day, afterwards they’ll be saying you knew best and that they loved it! I once had a mother of the bride say ‘that’s not a wedding dress’, because it wasn’t floor length and ivory (don’t get me wrong, I looove floor length ivory dresses – I have some in my range and there are some seriously stunning one’s out there too! ), but the point here is to remember is that a wedding dress is anything you want it to be – whether you stick to – or – break tradition. It is about you and how you envisage seeing yourself on your big day. Whether you choose a gorgeously simple outfit that you can wear again, a full princess dress, or absolutely anything else in between. Louise Rose Couture is here to help every step of the way and create your dreams in the form of a dress (or jumpsuit or separates, of course!). With each outfit being made individually for our brides, you will end up with a one-of-a-kind dress that your guests will be talking about long after the big day! 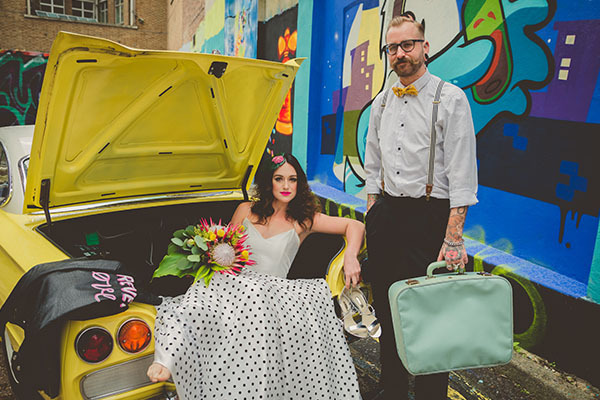 If you are considering an alternative wedding dress, something unconventional, here are a few ideas for you to consider when deciding on your dress. Coloured wedding dresses can still feel really bridal whilst feeling more ‘you’, if ivory isn’t your thing. Adding a gorgeous blush or pale blue tulle skirt can be a subtle way to incorporate a subtle dash of colour to your ensemble, without being too drastic. Pastel colour tulles over an ivory base create a beautiful blend of tones. We absolutely love floral wedding dresses too. 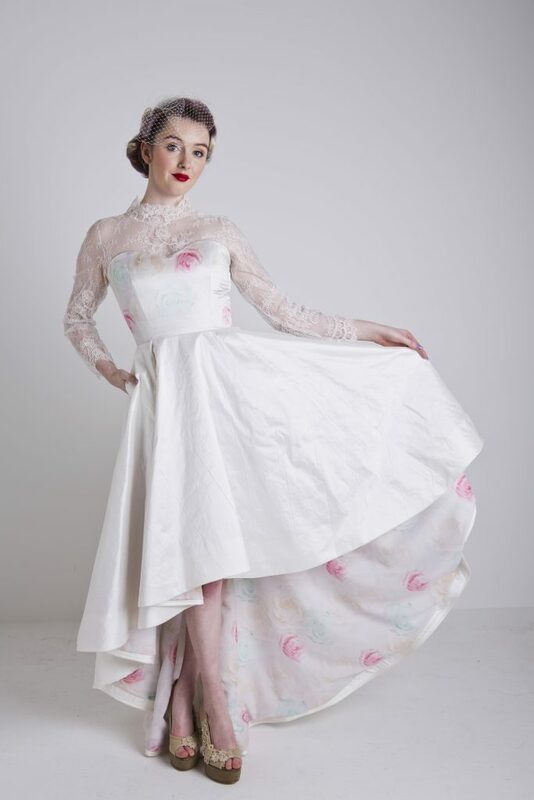 You could go all over floral, or how about a floral lining on a high low dress, like our Pearl dress, to create some extra interest? You can go as bold or as subtle as you like with a great floral print. Pastels and floral’s not your thing? A black wedding dress can be super striking and can be styled to your own look. From chic and sophisticated, to gorgeously alternative with a gothic moody vibe. Thinking of going short? 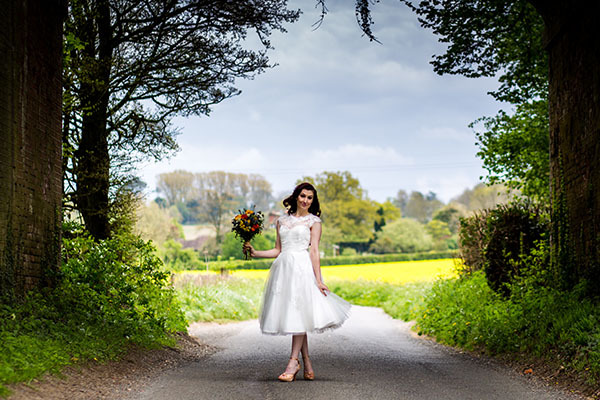 In our earlier post we’ve given 10 reasons why we love a tea length wedding dress. Such a timeless style which can be styled for a retro 50s style, or a simple and chic modern look. Of course, these are just a few ideas, there really is no limits if you have your dress made bespoke for you. Hopefully this has given you some inspiration for your wedding dress or the confidence to express your true self on your big day! Drop me a line if you’d like to discuss the possibilities for your dress – I’m always happy to chat and advise on silhouettes, fabric choices and designs that will work for you. 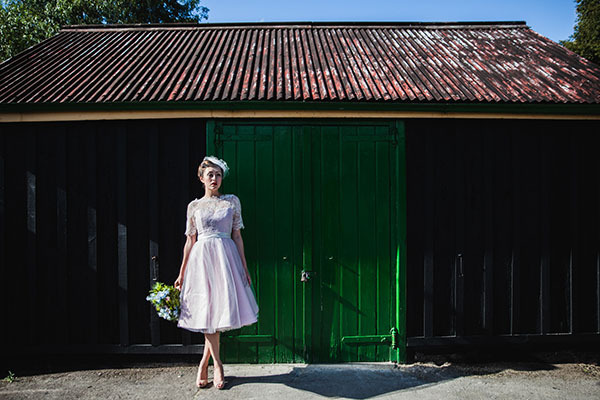 Shall we get started and design you your dream dress?